(From left to right): Brian Lawless, business development manager, Alltech; Si Cook, Texas Farm Bureau executive director/chief operating officer; Lee Pritchard, account manager for Ridley Block Operations, an Alltech company; Neil Walter, Texas Farm Bureau District 8 state director; and Randy Asher, regional sales manager for Alltech. LEXINGTON, Ky. (Nov. 7, 2017) – As Harvey’s winds died down, and the waters were still rising, Alltech launched Hope After Harvey to raise support for Texas farmers and ranchers, who lead the U.S. in cattle, cotton, hay, sheep and goat production. 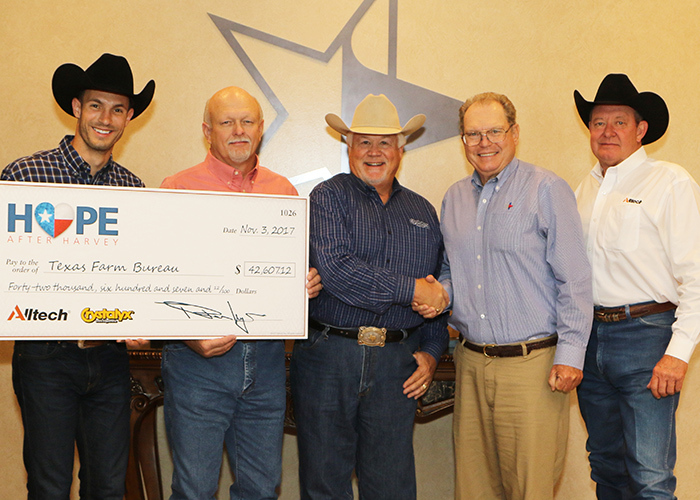 Additionally, the Alltech family committed to donating $100,000 in value of animal feed and crop products, which have been distributed through dealers and Texas AgriLife Extension.